Celebrate is an impressive Del Webb 55+ community in a premiere Fredericksburg, Virginia location. Located just one hour south of the nation’s capital and one hour north of Virginia’s capital, Fredericksburg is a lovely destination for a historic vacation or a picturesque retirement. The region includes Civil War battlegrounds, historic buildings and local museums, as well as modern-day restaurants and retail centers. Relocating active adults will also find several amenity-rich communities throughout the area. Fredericksburg enjoys a prime Northern Virginia location, halfway between Richmond and Washington D.C. Nearby destinations ideal for weekend getaways include Shenandoah National Park in the Blue Ridge Mountains, coastal towns along the Chesapeake Bay and nearby Charlottesville, Virginia. Interstate 95 also runs through town, making it easy for residents to travel up and down the East Coast and making the city a popular stopover spot for outside travelers. The climate in Fredericksburg includes four distinct seasons, with flowering springs, hot summers, colorful autumns and mild winters. Average daytime highs during the summer months are in the high 80s, although high levels of humidity can make it feel hotter. Winter temperatures are typically in the mid- to high 40s during the day, but occasional snowfalls are not uncommon. Tourism is a large part of Fredericksburg’s economy, with attractions ranging from Civil War battlegrounds and historic buildings to retail centers and outdoor recreations. History buffs can visit the important battlegrounds, including the site of the Battle of Fredericksburg, which have been preserved as part of the Fredericksburg and Spotsylvania National Military Park. The city is also home to the University of Mary Washington, which was founded in 1908. Historic architecture is prevalent through the 40-block Fredericksburg Historic District, featuring hundreds of buildings and homes dating from the 18th and 19th centuries. Just a few of these interesting attractions include the James Monroe Museum and Memorial Library, the Hugh Mercer Apothecary Shop, the Rising Sun Tavern and the Mary Washington House, where George Washington’s mother lived during her final years. 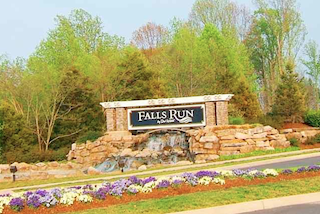 Falls Run is a 55+ community by Del Webb just three miles from downtown Fredericksburg, Virginia. For more modern-day entertainment, Fredericksburg offers many impressive retail centers filled with a variety of shops, restaurants and other attractions. At Central Park, the attractions extend to a 15-screen movie theater, a golfing center and an arcade complete with bumper cars and a climbing wall. 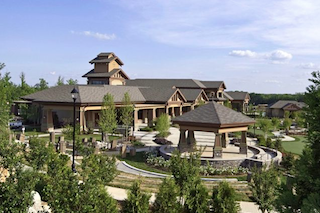 Other popular retail centers include Spotsylvania Towne Centre, Miller Farms Market, Aquia Town Center, Doc Stone Commons and the Design Center of Fredericksburg. Active adults who would like to relocate to the area can find a wide range of homes in several age-restricted communities. Celebrate, by Del Webb, opened in 2008 with plans for 1,100 homes, including attached villas and single-family designs. The community amenities include a 38,000 square-foot clubhouse, swimming pools, a putting green and many more outdoor recreations. New and resale homes can also be found at Virginia Heritage at Lee's Parke, a Lennar Homes community which stretches across 416 acres of rolling countryside. This community also features an amenity-rich clubhouse for social and recreational activities, as well as grounds with sports courts, a swimming pool and other attractions. Homebuyers may also find their dream home at Falls Run, a gated Del Webb community which promotes country club living just three miles from Downtown Fredericksburg. Whether vacationing, relocating or just passing through town, Fredericksburg has plenty of attractions which appeal to a wide range of active adults.